Lance Kleckner wrote: The problem will be when you move or die, if you are utilizing your running bamboo, it will feel like it is not growing fast enough, but that goes with any plant that has uses. *, reading your last part regarding planting it near the neighbor's fence, would need to do more than mowing. It will pop up in their yard, bamboo will be hated more and more horror stories, etc. I think it should be kept in mind that bamboo is not a climax species, it can and will be shaded out by climax trees, at least in my part of the country, so if I die, and no one cares for the property, it becomes a climax forest of Tulip Poplar, Sweetgum, Hickory, and Red Oak, just like it would anyway. It's a lot more likely that the new owner would just bulldoze off the top 1' of soil to get rid of all of those plants, bamboo included, and turn it back into a parking lot. Yes, the bamboo pops up in the neighbor's yard, they mow it off weekly, along with the rest of the lawn. I consider a fair trade, their Leyland Cypress has roots in my yard, my bamboo has rhizomes in theirs. In northeast georgia, anywhere that isn't mowed, grazed, or sprayed will have 2' tall pine trees in a year's time which then grow 3 or more feet a year until they reach 80'. I've used very rotten wood like that pictured and it works quite well. As others mentioned, urine works well to get plants goings with wood like that. The rotten wood should act like a huge sponge. I wouldn't hesitate to use that wood in one of my hugels. what about peach trees on a non dwarfing rootstock or ungrafted ones? I've transplanted volunteer peaches and had them grow 3' a year with some urine application and they can produce dense shade if left unpruned. Bamboo canes are great for trellis, plant stakes, ect. Especially if you grow a species of timber bamboo. A bamboo colony can create a tremendous amount of biomass in a small area and provide a great visual and wind barrier plus being a nice bird habitat. There are species that if mulched, will retain their leaves at near 0F temps. If you get a timber type bamboo they will handle the snow and ice load you get with minimal cane breakage. They will bend over and even touch the ground so do plan for that. Once the colony is established, an aggressive bamboo can send runners out a distance equal to the height of the canes or more. However, they only send up canes for a few weeks in the spring, so you would only have to mow the nearby area once or twice a year. Or you could go out with a golf club, a big stick, sturdy shoes, ect. once every few days during the shoot season and squash/whack the canes coming up where you don't want them. Much like planting a tree, do think about how tall a plant you want. You can have an impressive and productive colony in as little as a 10' by 20' space if the roots are allowed to extend out into the mowed area. My experience is that an established bamboo colony's roots will outcompete lawn grasses for moisture and create a ring of sparse to no lawn around them in areas that get dry during the summer. 3 year old huglekultur beds are failures, what am I doing wrong? I have had small hugelbeds be sucessful in NE Ga. However, whenever the plants looked nitrogen deficient I watered them with 10:1 urine which made a huge difference. My hugels were mostly constructed with rotten logs and bark so even with logs there will be a huge nitrogen demand due to the quick rate of decay in this climate. I dug down about 1' to get through the almost inpermeable sandy clay layer to reach the clayey sand layer so there would be drainage after a rainy spell, but the hugle would still catch water. 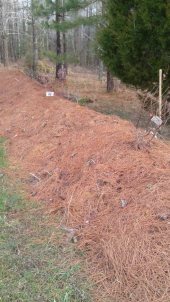 I used the excavated clay to make 6" walls along the slopes of the hugle where I could place a pocket of well composted tree chips to give transplants a pocket of rich soil to get started in. My hugels weren't any larger than the ones pictured, but I did water them sparingly during the long drought. I think dilute urine and some provision to water during extreme dry spells would fix your problems with the hugels, you have already done the hard part, it would be a shame to give up now. I don't think the brand of the light fixture matters much. I've used the twin tube T12 or or T8 shop lights. Choosing good bulbs is important though. Since they don't put out a lot of heat, the seedlings can have their upper leaves as close as 6" to the lights without heat damage. You would need several lights to completely cover a 3' by 4' area as each light only illuminates a 1' wide strip due to being so close to the plants. I have had good success with using 48" fluorescent lights. Most hardware or home improvement places sell them. The seedlings need to be about 8" from the tubes. I use twin tube shop lights, make sure you use either plant grow bulbs or if those aren't available, a cool white or natural light bulb with a CRI of as close to 100 as you can find as cheap bulbs with a low CRI will not work well. Anyone treat fusarium wilt with Brassicas? It appears that fusarium wilt has struck my three hugels with dying tomato plants and under performing pepper plants. The sweet potatoes, on the other hand are acting like kudzu, gleefully sending vines out in all directions. I've seen a few articles about using Brassica species, such as a mustard cover crop to fumigate the soil, and was wondering if anyone has any experience with that. The articles speak of mowing and disking the mustard plants in, which, of course, would have to be adapted on a hugelbed. I wanted to add that in my experience, raised beds have to be at least 1' thick of organic material to work and still dry out quickly, although my tall hugels have the same problem during the long dry spells that we get.